www.High.St supports the traditional High Street and its small independent retailers and businesses. If you are a small business, we will give you a link to your own website for free, just contact us with the details, or, if you don't have a website, we can create a web page for you (see our sample pages) and link to that for just £120 plus VAT (conditions apply). The main benefit to you is a web presence with a company that is very well placed in the search engines, bringing you more customers. Everybody can also benefit from our new High.St email forwarding service. This is particularly beneficial for businesses that currently use a hotmail, bt or similar address. High Street subscribers get an email address of the form: yourshop@yourtown.high.st - this looks more professional. All email sent to your new High.St address is virus checked and forwarded to your existing email address. This is an additional service, your current email arrangements are unaffected. Linking your High.St email address to a physical High Street address is natural and makes it very easy for customers and suppliers to remember. A High.St email address is never forgotten. No. 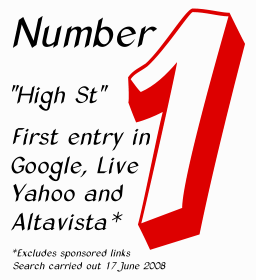 1 search result* for "high st" on Google, Yahoo, Altavista and alltheweb. Unique and memorable High.St name that will make your business stand out from the rest. Link provided to your own web site (we can make you a page if you haven't got one already). Never forgotten email address: Shop@Town.High.St. - As simple as posting a letter! All High.St emails checked for viruses. High Street - Great site for tourists planning their vacation. High St - Great site for locals wanting to check on availability or make an appointment. High.St - Great site for businesses to gain a strong web presence and show off their wares. Town based, rather than the usual product based site. No contract or tie in for businesses subscribing to the High Street. A comprehensive site search facility is available to users. * True on 17 April 2008 but always subject to change (on 10 Sep 07 "high st" was number one on Google, Yaho and Microsoft Live search. 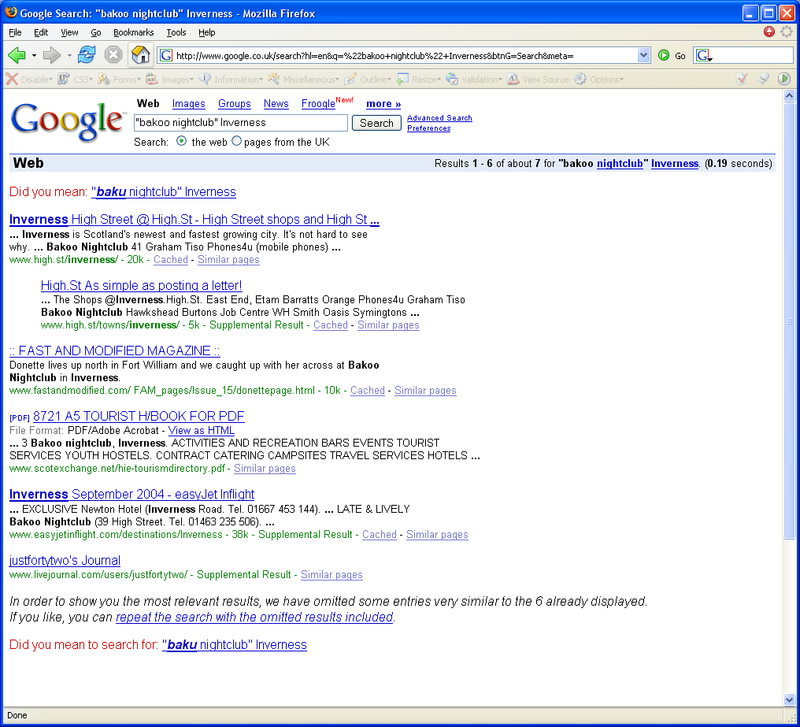 On 3 March 2006 we were 1st on Yahoo and MSN Search, 2nd on Altavista and 3rd on Google. On 19 April 2005 we became number 1 on Google). A typical search for a business in a town, such as: 'Bakoo nightclub Inverness' also yields excellent results in most cases. If you just want us to create a web page for you, please contact us direct (see our sample page for ideas). We will invoice you on completetion of your web page. A condition of taking a web page is that a one-off 12 month subscription to the email service is required. The cost of our High.St email service is just £5.00 plus VAT per month. There is nothing more to pay. A free trial is available, follow the links to Step 3 to learn how. Not on the High Street? - Don't worry, you can still join us. See the FAQ page for more details. No website of your own? - Don't worry, you can still join us. See the Sample Page for more details. Your telephone number and link to your own website are included free of charge. Please check your entry and advise us of any changes. If you have any more questions about the service, please read our Frequently Asked Questions (FAQ) page first. If you have any other questions, please contact us by email at .